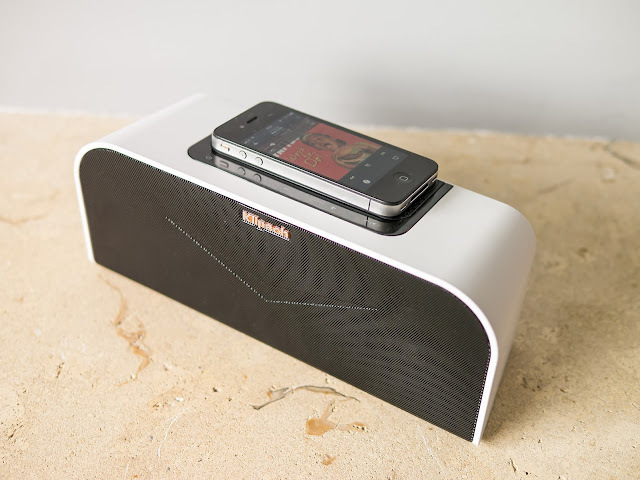 Oluv's Gadgets: Review: Klipsch KMC-1, the big letdown! Review: Klipsch KMC-1, the big letdown! I started becoming interested in Klipsch speakers, when I heard the KMC-3 my friend brought along so we could compare it to my Altec Lansing MIX. Infact the Klipsch wiped the floor with my Altec Lansing producing an overall louder and more punchy sound despite being smaller. But for portable use the KMC-3 needed battteries and for my taste it was still a bit large to really being taken with me. Then Klipsch announced the smaller KMC-1 which looks nearly like the big brother, but much smaller sizewise, which should allow to be taken everywhere easily. 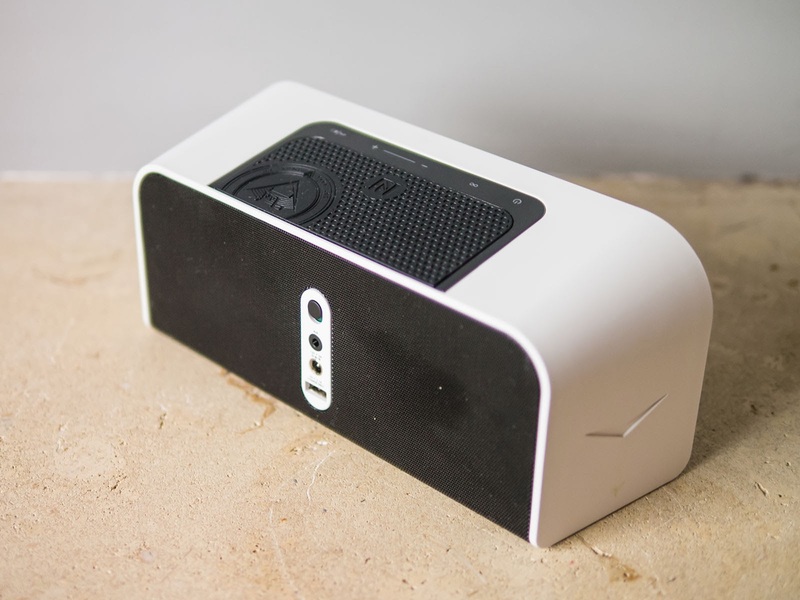 It also includs a rechargeable battery, so that I thought I should give it a try if this could be the best mobile boombox so far? The KMC-1 which stands for "Klipsch Music Center" came inside a rather large and heavy box. 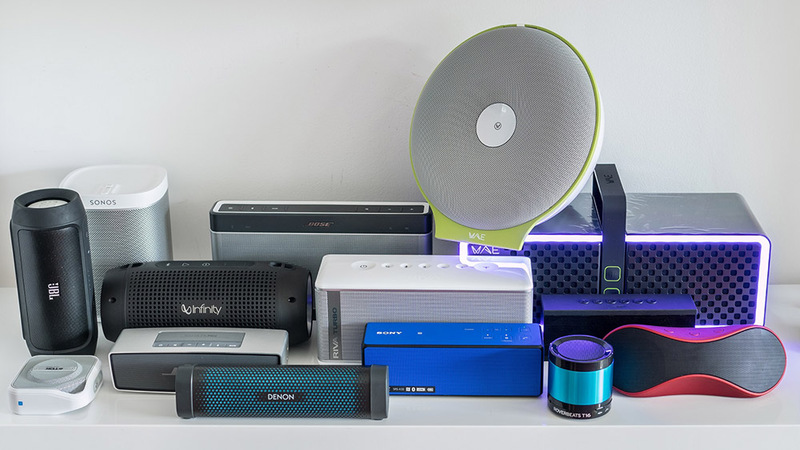 The speaker itself is about the size of a Big Jambox thus considerably larger than the Bose Soundlink Mini for example. 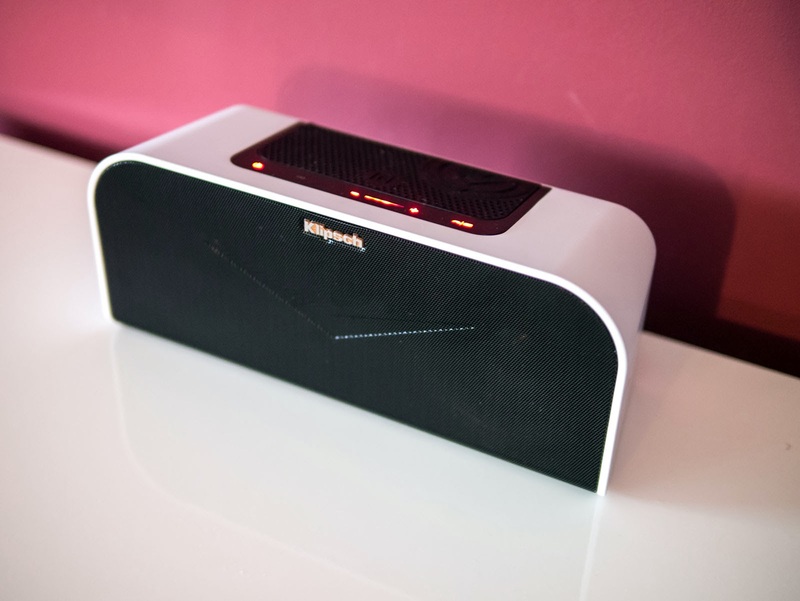 Despite having a plastic body, look and feel of the speaker are really positive, as it has some heft to it and feels pretty sturdy at the same time. The paint of the main body has a kind of soft feel, the front and back speaker mesh is out of metal, the top plate which contains the NFC-enabled area is rubberized. I assume the whole area is also meant for placing your mobile phone. It has about the size of a standard phone, though a larger phablet would look rather out of place there. There are hardly any hardware-buttons on the device. There is only the main power switch at the back. There you can also find an auxiliary input and the AC-power input. In addition the KMC-1 is also equipped with an USB-output, which can be used to charge external devices. In fact this also works when the speaker is running from its internal battery, but it will of course reduce overall playing time. 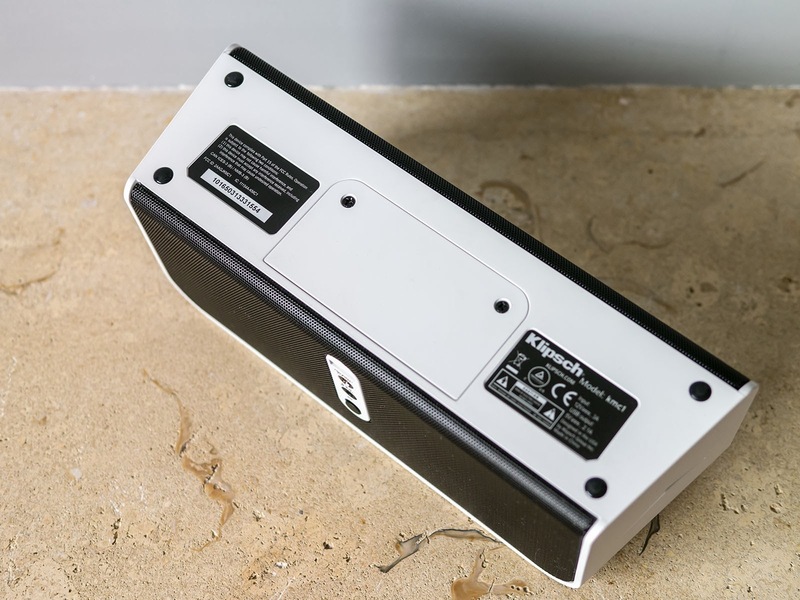 On top of the speaker you can find a single touch-sensitive area with another power/standby button, a pairing button and the volume control with an additional light-chain showing the actual volume level. Unfortuantely the volume of the speaker is not synchronized to the volume of the connected device. An additional battery/call-button reveals that the KMC-1 even has hands-free included. There is nothing written in the manual if the internal battery can be replaced, but at the bottom there is a screwed down cover which most likely should contain the battery. I haven't looked inside, so I cannot say if the battery is some specific model or if a standard battery pack can be used. Powering the speaker on will play a cheesy guitar-chord as confirmation tone. Bluetooth pairing is forced through a longer touch of the pairing-symbol. When successfully paired another guitar-sound together with some kind of applause is played. The confirmation tones are pretty annoying and unnecessary. I have not found any way to turn them off. I would prefer a simple silent beep or something similar, but the current tones sound really bad. At least the speaker doesn't talk as some other ones. The KMC-1 supports Apt-X which should allow the best possible audio quality. Thanks to Apple not supporting Apt-X on their iPhone I only tested normal Bluetooth which in case of the iPhone should be some AAC-codec. An issue I have found is that unlike most other bluetooth speakers I have tried, the Klipsch does not automatically reconnect to previously paired devices after power on. You have to force the connection each time from your device. But there is another feature, which maybe is the reason for that as the speaker has some kind of automatic standby-mode, if it stays idle for some time. From this mode you don't need to power the speaker on manually, but on your phone just select it from your bluetooth-devices and it should automatically turn on. Audio quality is a kind of mixed bag. I was really disappointed with the first sounds the KMC-1 was throwing at me. At low volumes there was hardly any body to the music. Bass was very subdued, treble was somehow sizzling, sounding rather metallic, with remaining mids that didn't overwhelm me either. Treble seemed also quite directional as sound became considerably worse when listened from above or from the sides. Overall the sound was probably the most unspectacular I have heard for quite a long time. It reminded me rather of a kitchen radio than a mature "boombox". Even the small Soundmatters FoxL didn't sound that much worse at lowest levels than the Klipsch. You really had to turn up the speaker as loud as possible until it started to get some punch with bass becoming this particular drive so that you could feel the vibration of the passive radiators. In fact the speaker could play down to about 40Hz without much drop in amplitute, despite the specs claiming only 65Hz or 56Hz as lowest usable bass frequency. The louder played the better and more powerful the KMC sounded with one drawback of severe distortion starting to creep in at levels near maximum. The speaker sounded best one notch below beginning distortion. Most songs were only playable up to 75%, others already caused distrotion at 60%. Particularly peaks of kick-drums were prone to clipping, not so bass-sounds which usually sounded rather clean. Compared to the Bose Soundlink Mini the KMC-1 could theoretically play much louder, but not without sounding really harsh and distorted at the same time. There doesn't seem to be any limiter or dynamic bass adjustment active, which results in little bass at low volumes and much bass at high volumes but at the same time clipping and distortion. I expected really more from the Klipsch KMC-1. I thought the KMC-1 would at least come close to the performance of its bigger brother KMC-3, but in reality it only sounded convincing at levels near maximum, while at the same time the speaker already struggled because of distortion. A speaker that only sounds acceptable in a narrow volume-window is unusable for me, while others might prefer exclusively high volumes and nevertheless like the KMC-1, because it really sounds nice and powerful at higher levels, but the strong clipping made the overall listening experience rather frustrating for me. On the one hand you feel the need to crank the speaker, on the other hand if you crank it too much, the sound suffers. Look and feel was certainly convincing, but Klipsch could have done without the needless confirmation tones when the speaker is turned on or off, or when it pairs with another device. I wouldn't want to recommend the Klipsch KMC-1 to anyone, as for comfortable home listening the sound is not good enough, while for loud outdoor use it is not powerful enough ending up with a distorted sound. Even if the KMC-1 was supposed to sound neutral, in reality it doesn't because the overall sound has a hollow character to it with rather biting treble. If "boom" is really important I would actually choose the UE Wireless Boombox over the KMC-1, which meanwhile can be had for less than half the price. Although the UE Wireless Boombox also distorts at high levels, at least it is not sounding much worse at lower levels. 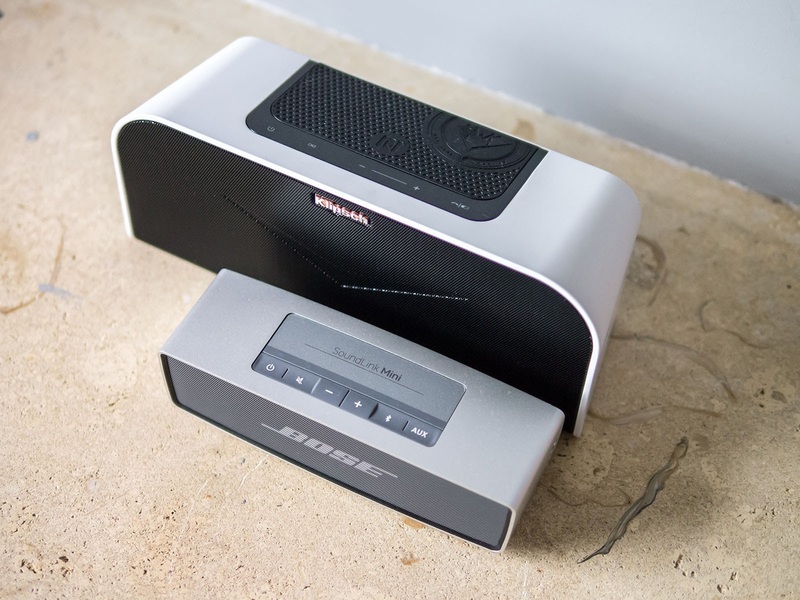 An even better choice could be the TDK A33, which is smaller and sounds pretty good across the whole volume, but it won't play neither as loud as the Klipsch nor as the UE Wireless Boombox. I do agree with some of your review, that the KMC 1 has to be played loud to optimize the sound, but I think the treble sounds good on it. yes I do not have the expert ears that you do. I actually bought this KMC 1 a couple years ago, for less than half the original price of $300 USD. For the most part, I really like the way it sounds, and from what I can tell, it only distorts when you have the volume up to almost max or maximum. The main issue is the battery is complete garbage. And the customer service is also garbage. They have defective speakers and they dont back them at all. Mine won't charge, used it once and then died. When I contacted them them hey aid I can buy a new charger for $60 dollars... really...anyways, it's a known issue and they state that unplugging the battery and plugging it back in after will fix the issue. It didnt. So essentially I have a very over priced paperweight. Very disappointed. 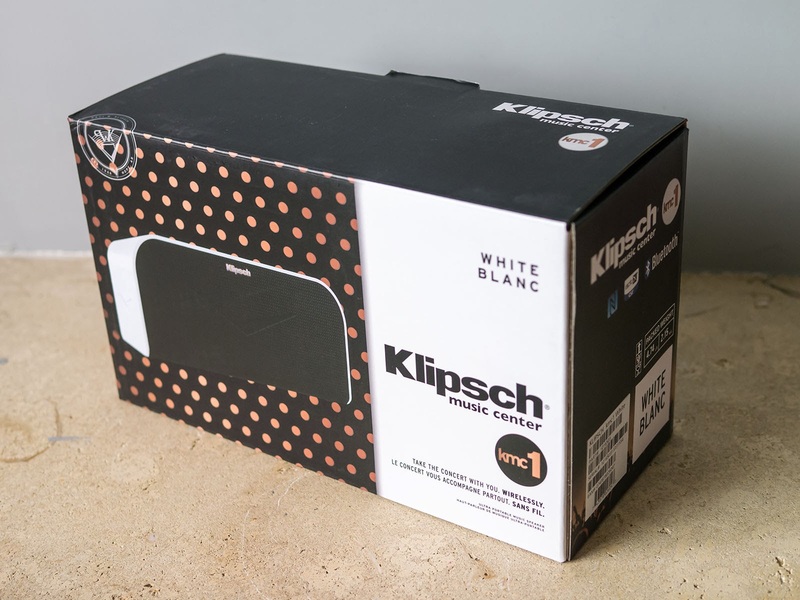 Won't buy anything else from klipsch. Wish I could say the support was better. small Hi-Fi system.The low bass is unbelievable for a system this size and the highs have a great deal of alacrity. The criticism of the brief musical notes that the unit sounds at startup, shutoff and upon connection to a Bluetooth source is just plain silly. If you can still find one (it has been discontinued) get it! it's a distorted mess if you increase volume and at low levels it is tinny as a phone speaker.